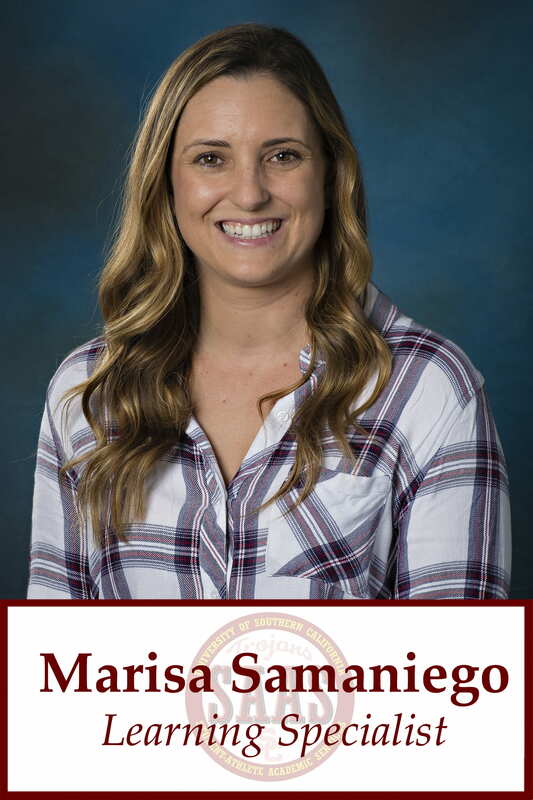 Marisa Samaniego joined SAAS as a Learning Specialist in Fall 2013. Previously, Marisa spent a year as the coordinator in Disability Services and Programs on campus. Prior to working at USC, Marisa earned her Master’s degree from the University of San Francisco in Sports Management. While pursuing her degree, she spent two years as an Academic Mentor at the University of California, Los Angeles working with both Olympic Sports and Football. Marisa also earned her Bachelor’s degree from UCLA in History while competing for the Swimming and Diving Team. Born and raised in Pasadena, California, Marisa currently resides in Santa Monica.